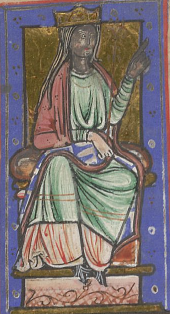 Ealhswith was a Mercian princess who married Alfred, Anglo-Saxon king of Wessex. She was never called queen and she never witnessed any charters during Alfred’s administration. But she was the mother of illustrious children and she is remembered as “the true and beloved lady of the English”. We know very little about Ealhswith’s life. She was the daughter of Aethelred Mucil, an east Mercian nobleman. Asser tells us he was the ealdorman of the Gaini around Gainsborough. This may be an ancient tribe of Mercia. Ealhswith’s mother was a scholar named Eadburgh who was well known at court. In the year 868, Alfred and his brother King Aethelred were campaigning, trying to rid England of the Vikings. King Burhred of Mercia was invaded by the “Great Army” of Scandinavians and they had camped out near Nottingham. Burhred sent a message to Alfred and Aethelred, appealing for help in the fight. Alfred and Aethelred took their troops to Nottingham and began a siege. This is where Alfred met and wooed Ealhswith. To seal the alliance with Mercia, Alfred and Ealhswith were married. The ceremony took place in the royal vill of Sutton Courtenay. There was feasting and gift-giving that lasted long into the night. But the festivities were interrupted when Alfred fell ill. We don’t really know what the illness was but he seemed to suffer from some intestinal disorder. It was the beginning of an affliction that would last for the rest of his life. Alfred succeeded his brother Aethelred as King of Wessex in 871. Ealhswith and Alfred had five children who survived and she may have had other children who died in infancy. All the children were educated as Alfred was an ardent advocate of education. Their first child was a daughter, Aethelflaed who was born c. 868. She would marry Aethelred of Mercia and became a formidable warrior who fought the Vikings and won. She was known as the Lady of the Mercians. Another daughter named Aethelgifu was born c. 869 and would become the Abbess of Shaftesbury. Their next child was a son who would be known as Edward the Elder. He succeeded his father as king of Wessex when Alfred died. A daughter named Aethelthryth or Elfrida was born c. 877. She married Count Baldwin of Flanders in 893 and was an ancestress of Matilda of Flanders who married William the Conqueror. Their last child was a son named Aethelweard, born c. 880. He would show a strong interest in books and learning and was educated at his father’s school at court. At Christmas in January of 878, the Viking leader Guthrum made a surprise attack on Alfred’s royal palace at Chippenham. Alfred fled with Ealhswith and his family to the rough and desolate island of Athelney in Somerset where they lived for about four months. Alfred led guerilla attacks on the Vikings and made plans for a huge offensive against Guthrum. The Battle of Eddington was fought in May of 878 and Alfred was victorious. A treaty was negotiated delineating boundaries for the kingdoms of Alfred and Guthrum. While there was relative peace in the kingdom, Ealhswith turned her attention to the establishment of the Nunnaminster (St. Mary’s Abbey) at Winchester. She may have dedicated the land of an urban estate that she owned there for the institution. She was responsible for the four stages of the foundation: construction of the monastic buildings, assembling the group of nuns to inhabit the Nunnaminster, the appointment of the first abbess who was named Aethelthryth and for the provision of the community’s endowment. She was prevented from finishing her project by death but her son Edward the Elder completed the foundation and dedicated his daughter Eadburh as a nun. Alfred died on October 26, 899. In his will, he designated that Ealhswith be given one hundred pounds in cash along with two great estates in Berkshire. One was Lambourn and the other was Wantage where Alfred was born. He also gave her his estate at Eddington, the site of his great victory over Guthrum. Alfred was initially buried in the Old Minster at Winchester. Ealhswith survived Alfred by three years and died on December 5, 902. She was buried in the Old Minster next to Alfred. Edward finished his father’s project of building the New Minster at Winchester and had his parents relics transferred there when it was completed. Intellectually nourishing, and historically fascinating. Well done! No worries about the ramble Glen. That is a real shame about the town not honoring it’s history. I didn’t realize they had a church there that might be the site of the marriage! I thought this was really interesting, Susan. Women at that period in history did not have the voices they should have. I had read that after Guthrum’s attack on Chippenham he held Ealhswith captive. Is this just mythology or was there some truth in it? Sounds like mythology to me Martin. Although I think it was a very narrow escape for the whole family. Thanks for reading. Battles and war was the way of life, even in this era!!!!! Alfred dies in 899, incredible all is great info, and in Christmas was in January, you know little details when I read I see the small details!!!! So his son was educated in his father school at court, that is very interesting!!!!!! Thank you, always learning!!!!!! Yes Princess! I love that you see the details. It is very interesting. I love this time period and will do more posts about this era.